15 “If you love me, keep my commands. 16 And I will ask the Father, and he will give you another advocate to help you and be with you forever— 17 the Spirit of truth. The world cannot accept him, because it neither sees him nor knows him. But you know him, for he lives with you and will be in you. 18 I will not leave you as orphans; I will come to you. 19 Before long, the world will not see me anymore, but you will see me. Because I live, you also will live. 20 On that day you will realize that I am in my Father, and you are in me, and I am in you. 21 Whoever has my commands and keeps them is the one who loves me. The one who loves me will be loved by my Father, and I too will love them and show myself to them.” 22 Then Judas (not Judas Iscariot) said, “But, Lord, why do you intend to show yourself to us and not to the world?” 23 Jesus replied, “Anyone who loves me will obey my teaching. My Father will love them, and we will come to them and make our home with them. 24 Anyone who does not love me will not obey my teaching. These words you hear are not my own; they belong to the Father who sent me. 25 “All this I have spoken while still with you. 26 But the Advocate, the Holy Spirit, whom the Father will send in my name, will teach you all things and will remind you of everything I have said to you. 27 Peace I leave with you; my peace I give you. I do not give to you as the world gives. Do not let your hearts be troubled and do not be afraid. 28 “You heard me say, ‘I am going away and I am coming back to you.’ If you loved me, you would be glad that I am going to the Father, for the Father is greater than I. 29 I have told you now before it happens, so that when it does happen you will believe. 30 I will not say much more to you, for the prince of this world is coming. He has no hold over me, 31 but he comes so that the world may learn that I love the Father and do exactly what my Father has commanded me. “Come now; let us leave. Heaven as their everlasting rest (v. 2, v. 3). Christ himself as their way (v. 4-11). The great power they shall gain through their prayers (v. 12-14). The coming of another comforter (v. 15-17). The fellowship and communion that should be between him and them after His departure (v. 18-24). The instructions which the Holy Spirit should give them (v. 25, v. 26). The peace Christ bequeathed to them (v. 27). Christ’s own cheerfulness about His departure (v. 28-31). It is easy to say that we love Jesus. But there is only one way to prove that we love him. We must obey his commands. This is not always easy. The good news is that we do not have to do it ourselves, but have the Holy Spirit to help. Here, the word help means “gives us the strength and the power to do things that we could not do alone.” It also means to comfort. When Jesus returned to heaven, the Holy Spirit would help the disciples to know what to say in difficult situations and the Holy Spirit would remain with them always. 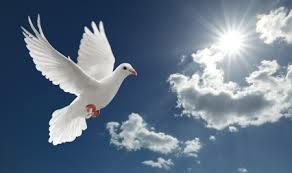 After Jesus had returned to heaven, he sent the Holy Spirit to live in all Christians (Acts chapter 2). But many people do not know Jesus, so they do not know the Holy Spirit either. They do not believe in Jesus, so they do not have the power of the Holy Spirit in their lives. But Christians have this power, because the Holy Spirit lives in them. The Holy Spirit changes a person to become more like Jesus. And then that person can do the things that Jesus did, too. After His resurrection, Jesus said that ‘you are in me’. And he said that ‘I am in you’. These phrases mean that all Christians are united with Jesus and therefore with the Father, too. The Father, the Son and the Holy Spirit all join with us. Jesus emphasised how to prove that our love for him is real. If we love somebody, we want to please that person. So if we really love Jesus, we will want to please him. So we will want to obey him. We do not obey him because of fear but because of love. ‘The people who love me, they will obey me. Then my Father will love them. We will come to them. And we will live with them. Jesus would not be the kind of Messiah that people expected. So, many people rejected him. They chose not to know him. During the 2000 years since, many people have heard the good news about Jesus. Some people have refused to believe in him. They have rejected him, too. So He does not show himself to them. He shows himself to those people who believe in him. Jesus is living in us by means of the Holy Spirit. We can know Jesus as our friend and we can talk to him about anything. He is real and He is alive! We prove our love for Jesus when we obey him. Jesus promised that the Holy Spirit would remind the disciples of His’ own words. The Holy Spirit can help us, too. When we read the Bible, he will help us. He will help us to understand it. In our daily lives, he will remind us of the things that we have learned. Jesus reminds us that the only real peace. To have this peace does not mean that we will not have trouble but we have Christ’s peace even when bad things happen. We have this peace when we are ill or in pain. We have this peace when people reject us. This is how Christ comforts us. When Jesus was on the earth, he was unable to do many things because of his physical body. But the Father does not have limits of time and space. So, in this way, the Father was greater than Jesus was. The verses end reminding us of Satan, who is the ruler of this world. Satan has some authority in the world because of Adam’s sin but no authority over Jesus, because Jesus has never sinned. The good news is that Satan has no authority over who believe in Jesus. Jesus’ righteousness becomes our righteousness. If you knew you were leaving your friends and would not see them for a long time, what kind of topics would you talk about? For a student who is about to graduate and leave their teachers and schooling, what would you guess their fears would be about? How is the Holy Spirit like “glue,” a binding agent? Imagine having a discussion with someone, how could the Holy Spirit help you and how could the Holy Spirit help the other person? On the Day of Pentecost, a prophecy was fulfilled. Acts 2:1 literally reads, “As the Day of Pentecost was being fulfilled.” What was fulfilled was the prophecy given by both Jesus and John the Baptist concerning the coming of the Holy Spirit. The coming of the Holy Spirit was to give power to the believers. It would become the birthday of the church. Here, the disciples were empowered to spread the Gospel’s message. The Old Testament period of law was concluded and a new era beginning. Those who believe in Jesus as Messiah during this present age would become part of the body of Christ and be know as the Christian Church. The church age began at Pentecost and will conclude when Christ comes back to us. The Day of Pentecost also saw the first converts to the new church. When Simon Peter delivered his sermon proclaiming that Christ had risen, some three thousand people became converted. Then those who gladly received his word were baptized; and that day about three thousand souls were added to them (Acts 2:41). The Holy Spirit, in fulfilling prophecies of both Jesus and John the Baptist, descended in a unique way upon all the believers, giving them power for service. the outpouring of the Holy Spirit began the age of the Christian church. The disciples were both baptized and filled with the Holy Spirit;. There, the sign of speaking in unknown languages was given to the disciples as evidence of the arrival of the Holy Spirit. Verse 1 Pentecost came 50 days after the Passover. Verse 4 The words ‘different languages’ here can also be ‘other tongues’. People do not always agree about what this means. The disciples spoke in foreign languages. This was so that all the foreign visitors in Jerusalem could understand them. Verse 6 A large crowd came together because of the noise. The believers came out into the street. Verses 17-18 Peter spoke verses from the book called Joel (Joel 2:28-32). They describe the Day of the Lord. For Jews, this meant the day when God would change the world. They believed that God would give power to Israel then. It would also be a day when God would bring terrible judgement. The Jews divided time into two ages. The Holy Spirit is often portrayed as a dove and fire – How do these images support your perception of the Holy Spirit? How might the Holy Spirit help someone share the Gospel? An area of continued confusion is the gift of tongues. Knowing that the Holy Spirit works in both the tongue and the ears, how might we explain this power? The birth of the church is when the Gospel’s message was spread out for the world to hear – What is our role in this function? How do we overcome our own reluctance to share the Gospel’s message and embolden others around us to share more often?